Nobody talks about this, which is ridiculous. So it's not glamorous and nothing related to dental hygiene looks pretty, smells nice, or makes you want to tell everyone about it - I don't care, this is important. What's the point in having a nice face and then opening your mouth and making everyone cringe? If you don't brush your teeth properly, if you don't floss every day, if you don't use mouth wash, and if you don't visit a dental hygienist or a doctor at least once a year - you are going to lose your teeth. If you haven't already, I'd recommend you book yourself in to see a dental hygienist. Providing you've had a general consultation with a dentist and you don't need any work on your teeth (like fillings) you can pretty much forget about him or her. The aim here is to never see that person ever again, literally. If you look after your teeth all you'll ever need to do is visit a dental hygienist - they can tell you all you need to know about the state of your oral health, alert you if something is going horribly wrong, prevent it from happening (if they can), and tell you when the damage is irreversible (so the dentist can fix it). It's not the best feeling in the world but a good hygienist won't make you cry and don't let the horror stories put you off. Your teeth are going to feel amazing afterwards, trust me. Always floss first. Actually, it doesn't matter, so long as you do it. I use Interdental Brushes to floss because who even bothers with dental tape anymore? It's really important you don't just buy random brushes and start jabbing them into your mouth. Your hygienist can tell you which size you need or buy a pack of mixed brushes to see what works for you. Pro Tip: You might need more than one size to cover all teeth. These little guys can get expensive - buy them in bulk, during promotional sales, or just put up with the cost because the alternative is gum disease. Your choice. I use an Oral-B Professional Care 3000. This one tells me off when I press too hard, gives me regular updates on which "quadrant" I should be working on, buzzes to let me know when my time is up, and is an all round good guy at cleaning teeth. Thumbs up Oral B. I'd totally recommend it but don't be pressured into buying an expensive brush - there are loads available and the majority all work the same. It's best to use a manual toothbrush in the mornings, switching to an electric brush at night. You'll notice the difference when you try it. Also: clean your tongue while you're in there. Finally, mouth wash. I hate this stuff. I use Colgate FluoriGard or Listerine Zero, both of which are alcohol free. Always buy alcohol free, unless you like the feeling of your mouth being on fire. Beauty bloggers don't talk about dental hygiene. I tried to find some examples and couldn't. I know it isn't glamorous, but I would have thought someone would have said "hey guys, you know what's important? CLEANING YOUR TEETH." It sounds obvious because it is yet that doesn't stop beauty bloggers describing colours and telling you how to apply skin care products so why doesn't anyone ever talk about dental hygiene? yay for talking about teeth! *high five* Seriously most people don't pay enough attention to their teeth, I know I never used to and thought what I was doing was fine. People don't brush their teeth for long enough either, and are surprised when they get those kind of brushes that tell them when enough is enough. The majority of people figure if their teeth don't hurt then they don't need to see a dentist; it's really important people realise the effects of poor oral hygiene sets in quickly but is often undetected for years because they refuse to see a dentist. By then it's too late and their teeth are falling out. I was so unsure about publishing this post but I'm glad I did now. Yep - you can do as much damage by brushing super hard as you can not brushing at all. Be careful. I swear my electric toothbrush has cracked my tooth! It wasn't cracked before I got it at christmas and it made my teeth really sensitive for a while but I checked a few weeks ago & there's a tiny almost invisible crack in my front tooth that is so sensitive to brush. I am terrified of going to the dentist & I have no idea how much it will cost to sort out on a student budget too! I suppose I will have to go eventually... ugh. It's very unlikely your electric toothbrush cracked your tooth (unless you brushed/pushed on the tooth crazy hard). It's more likely you brush started cleaning your teeth more effectively than a manual brush and dislodged dirt and debris that was keping a hairline crack from splitting further. Seriously - GO SEE A DENTIST. You might wince at the cost now but it won't be half as bad as it will be in several months time when the damage is even worse. Get it fixed and you'll feel so much better. If you can't get an NHS dentist then most private dentists offer dental plans, which make paying for treatment a lot cheaper. Good job for being the first to really talk about dental hygiene. It's an incredibly important subject but for whatever reason, people don't ever talk about it. I have to admit that I skip out on flossing too often which is terrible of me but I'm getting into the routine now. I think once I get a good routine down, I'll have to make a post about it too on my blog. Nobody talks about it and I find that WEIRD. 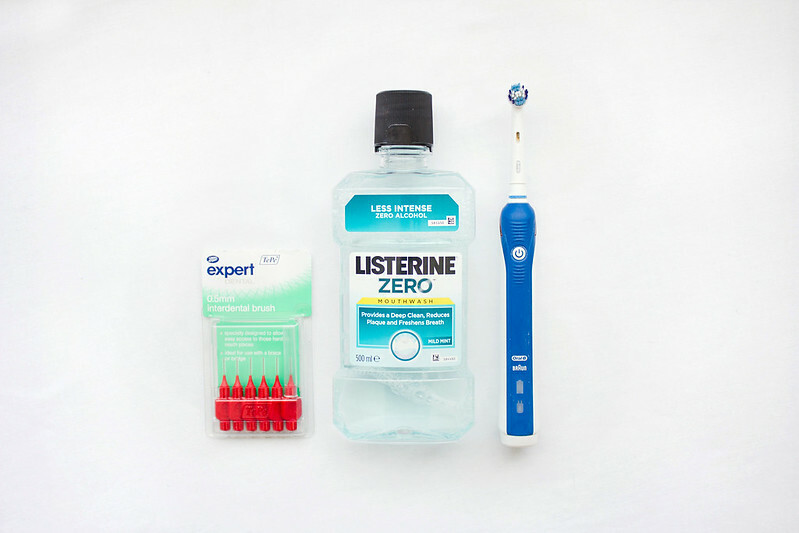 I would totally recommend regular hygiene appointments - especially if you find flossing a chore - these appointments will encourage you to keep flossing because your teeth feel SO GOOD afterwards you never want that feeling to disappear. ^just realised my blog name would be perfect for teeth hygiene posts...hahaha! I think a lot of people don't realise dental hygienists are available to them; hygienists can deep clean your teeth, something you just can't do yourself as home and it never cross people's minds that it's an option. i got told off for brushing my teeth too hard, so i try and use my left hand now as it makes me concentrate more, instead of just scrubbing away! oh, and i'm always smug when i tell people i've never had any fillings :) yay for clean teeth!